Take a peek into the world of our customers, to see how they benefit from our healthcare solutions, and deliver exceptional care. A look into Symphony Senior Living and how they are benefiting from our wireless nurse call system, RTLS In Motion. Symphony is an aging-in-place facility. A look into Rocky Ridge Retirement Community, how they are benefiting from our wireless nurse call system, RTLS In Motion, and how Momentum Healthware helped with the construction planning phase to reduce installation costs. New Dawn Memory Care operates Specialized Dementia Care facilities in Arizona, Colorado and Virginia. 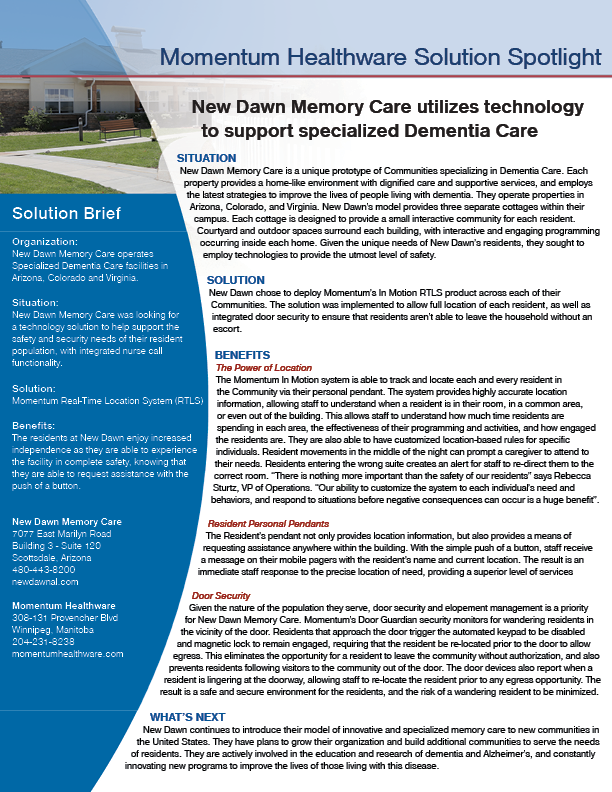 New Dawn Memory Care was looking for a technology solution to help support the safety and security needs of their resident population, with integrated nurse call functionality. A brief look into Momentum Healthware, and our current product offerings. A peek at how our wireless nurse call system, RTLS In Motion, has made a positive impact at Samaritan Village's day-to-day life, for both staff and residents.